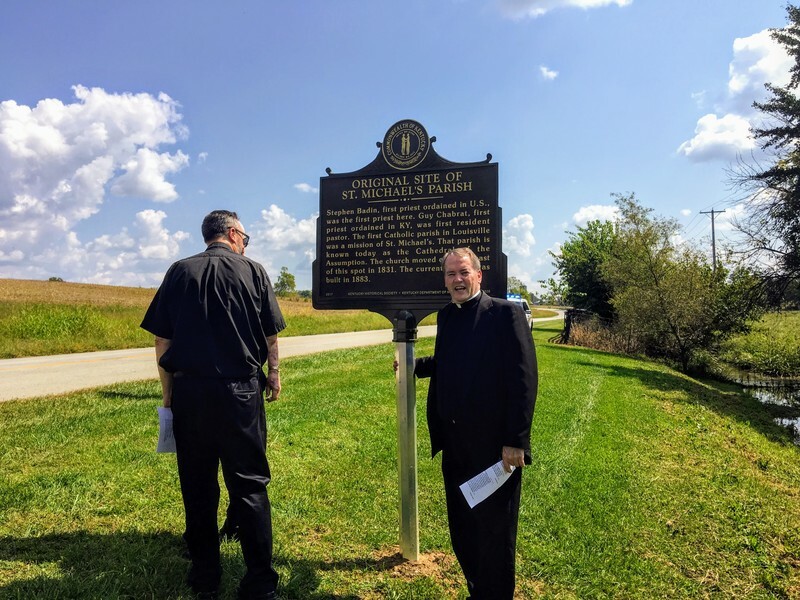 Historical maker #2526 commemorates the original home of St. Michael's Parish, the third Catholic parish established in the state of Kentucky. St. Michael's, located in Fairfield in Nelson County, served as an incubator for Catholicism in the state. 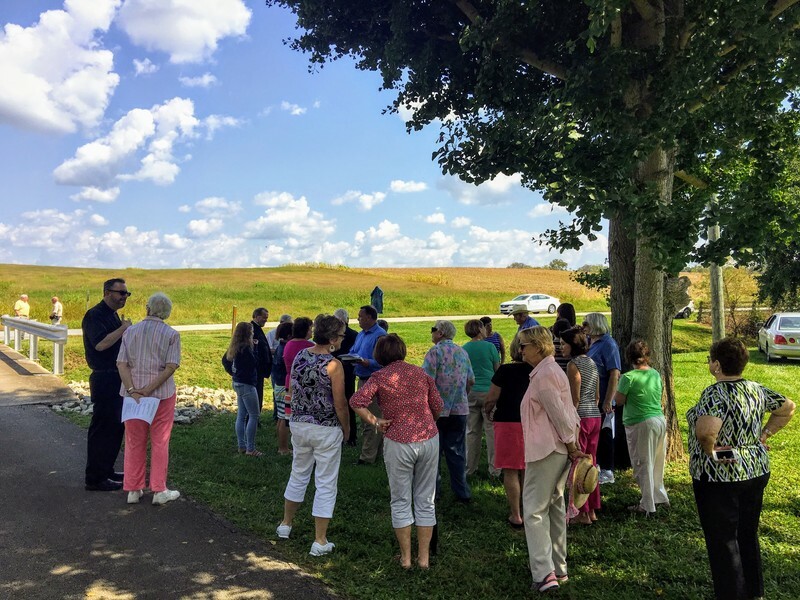 As part of Kentucky's "Holy Land," along with Marion and Washington Counties, Nelson County saw substantial Catholic immigration dating back to the eighteenth century. St. Michael's was the third parish started west of the Allegheny Mountains and its first priest, Stephen Badin, was the first priest ordained in the United States. Guy Chabrat, who was the first priest ordained in Kentucky, became the first resident pastor. The first parish established in Jefferson County began as a mission of St. Michael's. Today, that mission has grown in to the Cathedral of the Assumption in downtown Louisville. Catherine Spalding, founder of the Sisters of Charity of Nazareth and Spalding University, called St. Michael's her home parish. The Catholic luminaries who got their start at St. Michael's, such as Frances Gardiner, Richard Miles, Felix Newton, Grace Newton Simpson and countless others, made their mark across the country throughout the nineteenth century and into the twentieth as the nation and American Catholicism spread west. Today, St. Michael's parishioners continue in the tradition established by their predecessors. The marker is located approximately 1/2 mile west of Fairfield on KY-48, in front of the St. Michael's Cemetery at the original site of the church. Initially a simple wooden structure, the first church has long since been removed from the landscape, but some of the trees planted to line the way still survive and some of the foundation remains among the headstones. 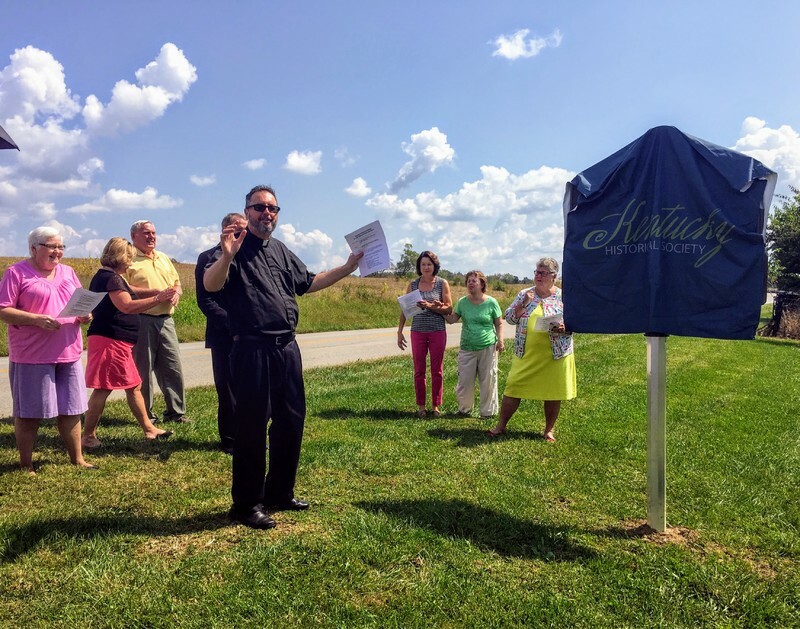 The dedication on September 17, 2017 marked the 225th anniversary of the founding of St. Michael's and the event was blessed with beautiful weather. Begun in 1792, oldest parish in Nelson Co. and third oldest west of the Alleghenies. Home parish of Catherine Spalding, founder of the Sisters of Charity of Nazareth (SCN); Frances Gardiner, fourth Superior of SCNs; Richard Miles, first Bishop in the state of TN; Felix Newton Pitt, trailblazer in education; & Grace Newton Simpson, notable Catholic leader of the 19th century. Over. Stephen Badin, first priest ordained in U.S., was the first priest here. Guy Chabrat, first priest ordained in KY, was first resident pastor. The first Catholic parish in Louisville was a mission of St. Michael's. That parish is known today as the Cathedral of the Assumption. The church moved one mile east of this spot in 1831. The current church was built in 1883. Historical Marker #2526 Dedication Ceremony ~ Creator: Andrew Patrick ~ Date: September 17, 2017. Awaiting the Dedication of Marker #2526: Waiting in the cool shade before the dedication of historical marker #2526. ~ Creator: Andrew Patrick ~ Date: September 17, 2017. Andrew Patrick, “Original Site of St. Michael's Parish ,” ExploreKYHistory, accessed April 22, 2019, https://explorekyhistory.ky.gov/items/show/795.